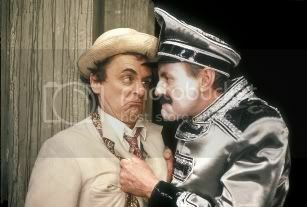 The Seventh Doctor story, Paradise Towers is due for DVD release in 2011 according to a blog by the story's writer Stephen Wyatt. First shown between 5th October and 26th October 1987 the four part story stars Sylvester McCoy as The Doctor with Bonnie Langford as Melanie along with guest stars Richard Briers as the Chief Caretaker, Elizabeth Spriggs as Tabby, Judy Cornwell as Maddy and Howard Cooke as Pex. The story was the second story of Season Twenty Four and was directed by Nicholas Mallett. In his blog Wyatt confirmed he has recorded an interview for inclusion on the disc as well as being part of the commentary team. A novelisation of the story, written by Wyatt, was published by Target Books in December 1988 and it was released on VHS in October 1995. 7pm for A Christmas Carol? Series Two for just 99p?